I am resurrecting a post I wrote two years ago in honor of the upcoming Valentine's Day "holiday" with a few minor changes. 3. Flowers - This works especially well if you know your lady's favorite flower. For me, it's the Stargazer Lily. I also love the color pink, carnations, roses, etc. And I like Cala Lillies, too. Try to send them to her at work where her friends and co-workers will see them. That'll earn you extra brownie points. And make sure they come in a vase, not a box! 8. Jewelry - Diamonds are nice, but so are earrings, necklaces, and bracelets. Ask a salesperson to help you choose something stylish in the costume jewelry section if your budget can't take diamonds right now. I have fallen in love with Charming Charlie! 9. Bubble Bath - And the time to take a long, hot bath without kids disturbing her! I love the detox rocks from Bath Junkie. And lavendar is a relaxing fragrance. I also like the "rock-type" lavendar/chamomile bath stuff from Bath and Body Works, but they are usually sold out. Ladies, what do you prefer as a Valentine gift? Happy Valentine's Day! 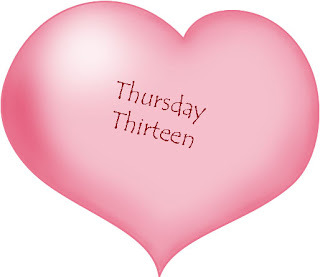 Visit Thursday Thirteen here. I love your tips. Valentine's is my favorite holiday. It's a holiday about love, the one true holiday that has always been about love for me. Great primer. Chocolate is always good in my book, and I love the idea of non-risque pajamas. I would also add that, before you buy that perfume, bubble bath or scented candle, make sure she actually likes them. Many women are allergic to scent, and nothing kills the mood faster than an allergic reaction, or a rip to the ER. I agree . . . homemade cards are the best! Great revival - always fun! Happy Valentines Day. Miss you!